Lübeck is one of north Germany’s most beautiful cities and is full of rich history. Any time of the year it is well worth visiting this beautiful city. And it is especially a lovely destination to visit during Christmas. The main Christmas market is at the city hall courtyard between Kohlmarkt and Breite Strasse and has also a marvelous historical flair to it. 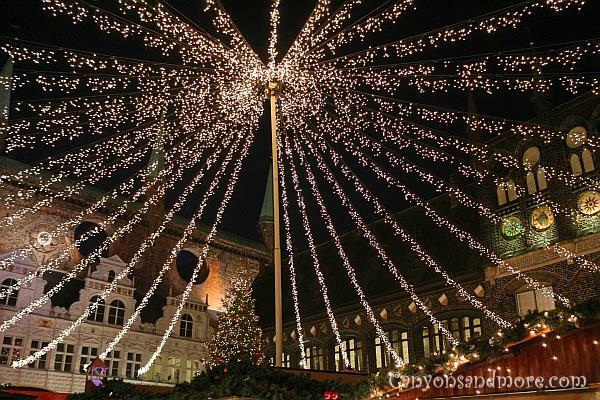 Lübeck’s Christmas market attracts tourists from all over and especially from Great Britain and the Scandinavian countries. The medieval setting of the market square with the most impressive city hall in the background adds a more dramatic feeling to the market. Each year, the market in Lübeck seems to change its appearance a little which makes it special again and again when visiting it. 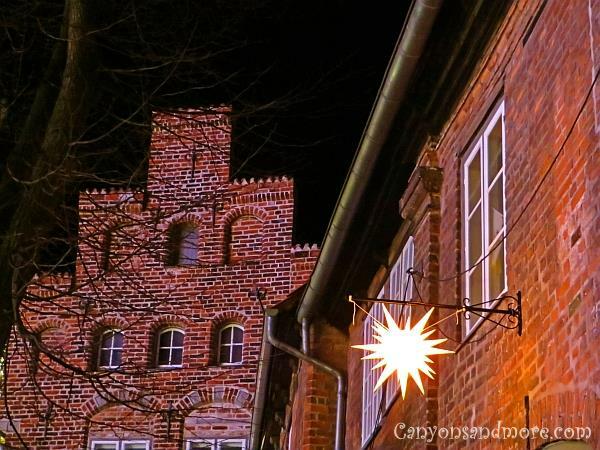 For the kids you will find a Märchenwald (Fairy Tale Forest) with moving attractions of different known fairy tales and you will find market stands all along the Breite Strasse, which is also the main shopping street of Lübeck. The image above is a view of the market in the year 2014. In the distance the St. Petri church overlooks the market. For a small fee, you can also go up into the tower of this church and see an impressive view over Lübeck. 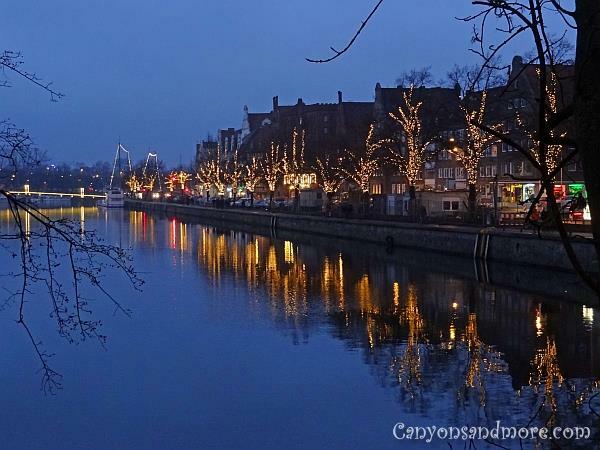 The city is located along the Trave River and not only is the city decked up for the holidays, but the trees and boats also get festively lit up for the season. This was a cold day to go to the market which was fine as it adds to the winter feeling. A cure can be found at the market. A plate of hot champignons in herb sauce and a cup of hot mulled wine or punch warms you up in a jiffy. Many locals also like to go to the market after work and meet up with friends to enjoy the evening. When the sun goes down, the lights of the market and the tree twinkle like stars over the market and give the market a special atmosphere. 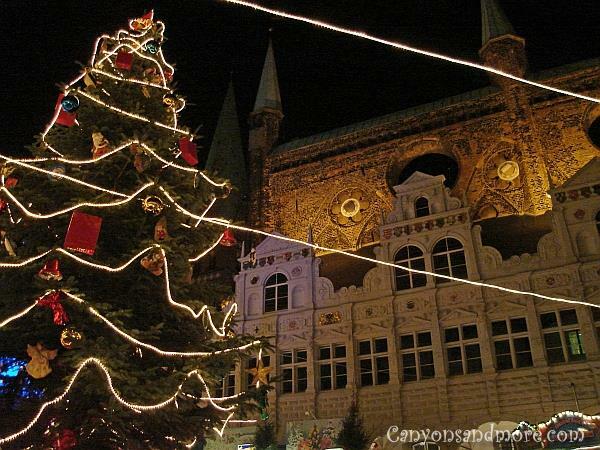 This is an image of the Christmas market tree that was made in 2006. Since this picture was made, the lighting has been changed to the image you see above this one. This pyramid is located on the Breite Strasse close to the Christmas market. You will find wooden pyramids at practically every larger Christmas market. The size and style varies with each market and most of them turn. Niederegger has been making marzipan since 1806 and even if you do not like marzipan, it is worth visiting this store and cafe. Niederegger is located in Lübeck on the Breite Strasse is an attraction for itself. Inside the store is wonderfully decorated for Christmas and you can get everything from marzipan figures, chocolate covered marzipan specialties, marzipan coffee, marzipan liquor, Christmas gifts, etc... At Christmas time the store window is of course decorated with marzipan figures. 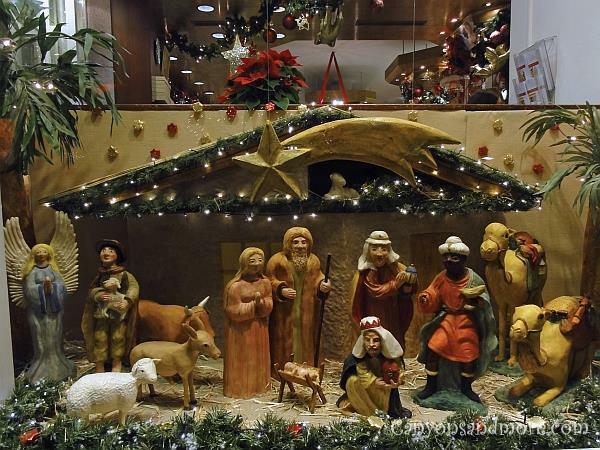 This is an example of the store window from 2012 with a nativity made only of marzipan. 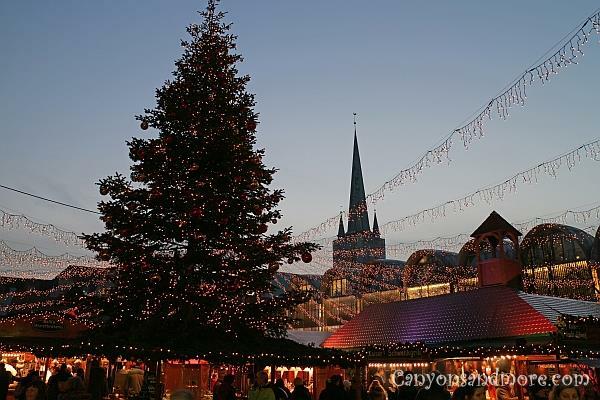 At practically every larger city Christmas market, you will find a Käthe Wohlfahrt store. 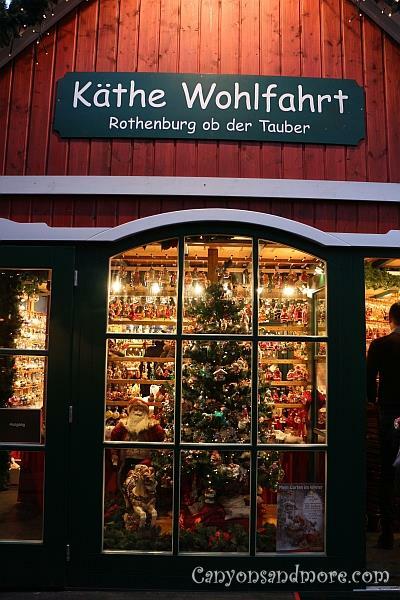 The original store can be found in Rothenburg ob der Tauber and is a Christmas store that is open all year round. It is famous for its high quality Christmas merchandise, especially in wooden ornaments, nutcrackers and other Christmas decorations. During the Christmas season, it is possible to visit one of these smaller versions of the store at other locations such as this one in Lübeck. 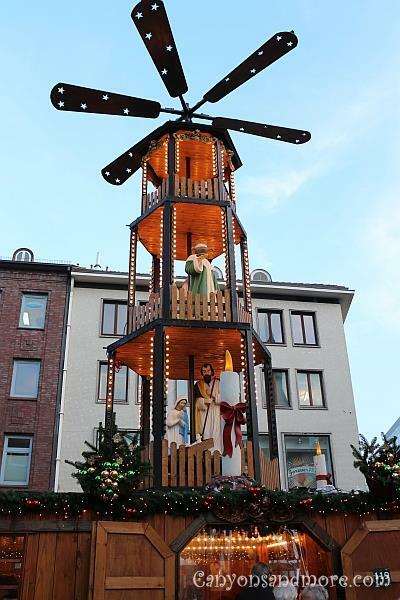 It is located in the middle of the Christmas market and is worth looking inside while there. The store entrance always looks so inviting. 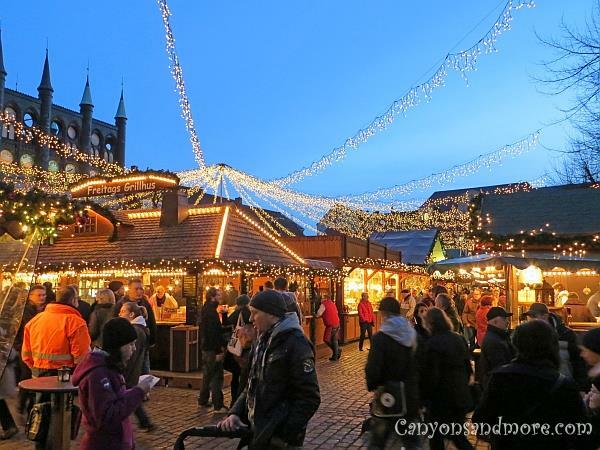 Not too far from the main Christmas market, you will find a medieval market with the local residents dressed up in ancient middle age clothing and selling handmade goods. It is located at the Marienkirche (the church) which looks so monumental behind the market and is the perfect setting for it. Here the market is not so well lit up which adds to the medieval flair of it. Bands playing ancient middle ages music also amplify the historical feeling. This market is also an interesting place to meet up with friends, have a bite to eat and something to drink. 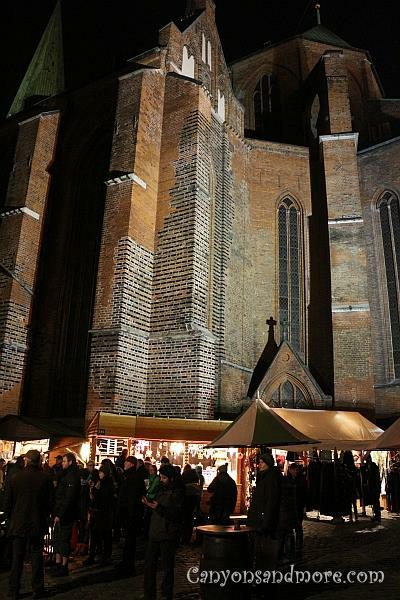 Away from the hustle and bustle of the Christmas market is the St. Jakobi Church of Lübeck. There is a path by the church where many of these Herrenhüter Stars were lit up and hanging, lighting the way like the star of Christmas.